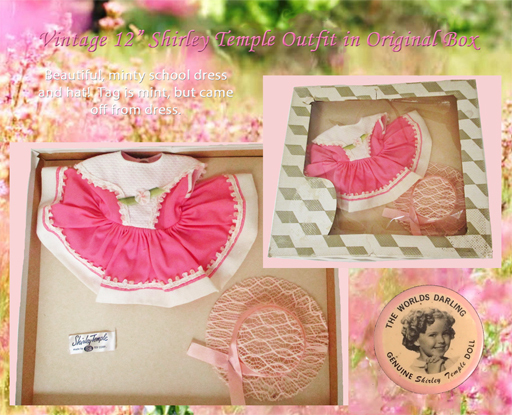 RARE & Beautiful Vintage 12" Shirley Temple School Dress and Hat with original box! This dress and hat have never been removed from their original box and are in mint condition. Crisp, bright pink cotton school dress with white trim around the skirt and sleeves, and a waffle-weave shawl bib on the bodice with a cute floral appliqué. Pink coordinating lacy hat with pink ribbon. The dress is tagged, but the tag has come off of the dress. The original box is in fair condition with discoloration, small tears and dents.